elyashiv3 from elimand on Vimeo. A transcript of the conversation (which does not appear to include all the nuances) can be found here. I have so many questions about this video, I hardly know where to begin. I find the attitude of the questioner extremely puzzling; it seems to me that he is incredibly patronizing towards Rav Elyashiv and relatively disinterested in what Rav Elyashiv actually answers, moving immediately to his next question. Is this my imagination? 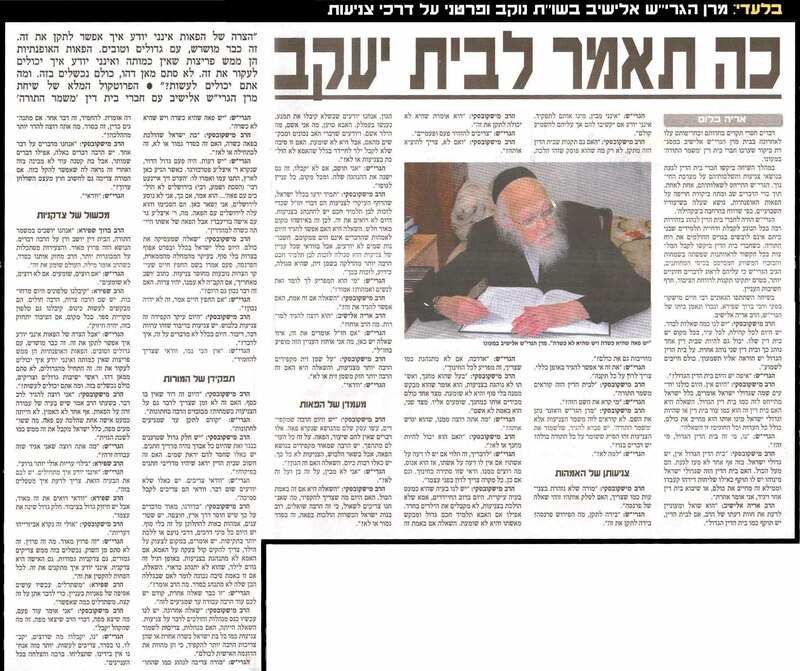 And did Rav Elyashiv say that a Beis Din appointed by the Gedolim would be halachically binding on all Klal Yisroel?! Which Gedolim would have to be in that Beis Din for this to be true? Would there have to be Sefardim or Chassidim? Did he say that this applies to dictates regarding tzniyus that are issued by the "Mishmar haTorah" Beis Din under discussion? It's not clear to me. Does anyone have any light to shed on any of this? Nothing to add except that this video made the blog circuits a while back and the consensus was that the questioner was acting in a chutzpadik manner towards R. Elyashiv. Agreed about the style of the questioner. Ironic as well since he specifically asks about the "chutzpah" of the generation. I've been meaning to point out on this blog that I thought very positively of Rabbi Slifkin’s speech in YI of Woodmere, were he presented the side of the banners(ie, Gedolim) extremely fairly, in my opinion. A side point I’d like to mention is that I’ve been fortunate to visit R Elyashiv twice for a beracha. What I still remember(and I have a photograph) was the seriousness with which he treated me the brief time I was there. (I was in the house a third time for Maariv, at the same table as the person in the video, as I could not get in to the inside room to meet him). I'm pretty sure that he rejected the suggestion that it would be binding on all of klal yisrael.